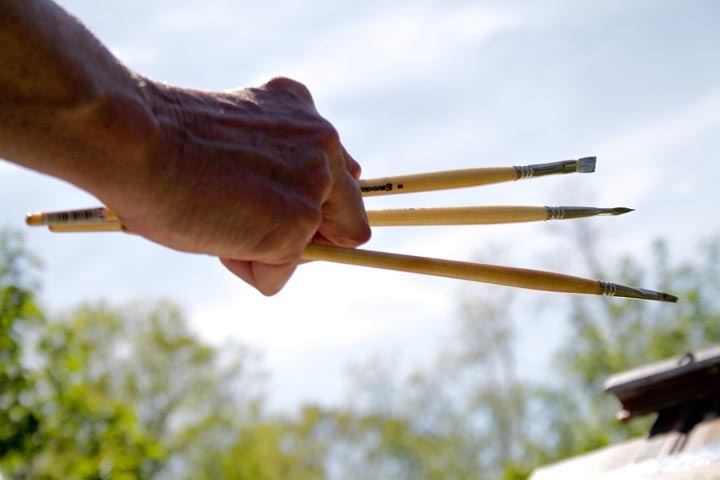 Paint brushes hit the road for upcoming plein air event. Finished works exhibited at The Workshop in Vineyard Haven beginning Sept. 12. Take 10 artists and three Island locations, give them three weeks to work their magic, then shake twice, stir once, add a spritz of lemon and what do you have? A Plein-Air Summer Breeze, a type of visual cocktail coming soon to a gallery near you. For 21 days, the artists will spend time in Menemsha, Katama and Turtle Brook Farm. They are instructed not to paint the same barn, lighthouse or other iconic structure. Otherwise all is fair on the canvas. Participating artists are Lowely Finnerty, Judith Howells, Kanta Lipsky, Peter Mallen, Marjorie Mason, Brandon Newton, Jim Shigley, Liz Taft, Kate Taylor and Valentine Estabrook. Go out in the field to check out their progress and then on Sept. 12, embrace the finished product at a reception for all the new works at The Workshop, a new gallery in Vineyard Haven located at 32 Beach Road. Visit vineyardartist.blogspot.com for daily updates.